Have you ever dreamed of entering your favorite virtual world? Well, the time is finally here. With the SIDARDOE VR headset, turn your smartphone into a virtual reality viewer. Relive exciting memories through concert and travel photos in 360 degree panoramic video and photos or watch the newest Hollywood blockbusters in private theater. With an Android smartphone, you can also connect to your PC to fully immerse yourself in your favorite video game world. Explore virtual reality in an immersive, cost-effective, and exciting way. Latest style with a fashionable design: Created by one of the top world designers on the basis of an ergonomic design, 2016 ushers in the latest 5th generation VR Headset. Anti-Bluelight Design: Removable Anti-Bluelight glass plate is easy to clean, and absorbs your smartphone's blu-ray to the maximum extent, relieving visual fatigue and providing a better viewing environment. Updated HD Lenses: High-definition optical resin lenses, 8-layer nano-coating, 5x polishing, 42mm Updated Lens. Reduces lens deformity and glare, effectively preventing visual fatigue, and provide a broader perspective. Improved Fit: PU leather face pad and adjustable headbands help you watch videos and play games more comfortably, and supports some eyeglass users. Convenient Usage with Smartphone: Magnetic adsorption cover and fastening strip hold your smartphone firmly. Use the convenient earphone jack and hidden headset cable to connect your smartphone and completely liberate your earphone. Not compatible with Curved screen. Bluetooth game controller support for Apple and Android systems. Convenient and practical self-timer function. Song selection made easy with included music controller. Use as a wireless mouse and turn your smartphone into a tablet. Advanced Tech: Turn your smartphone into a virtual reality viewer, experience the immersive, fun and exciting world of VR. 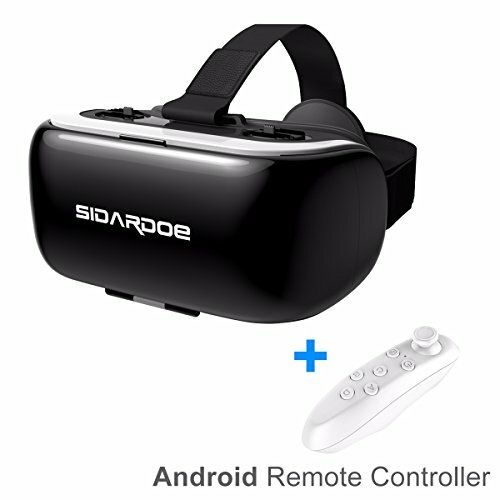 Enjoy 360 degree panoramic videos and photos, watching 3D IMAX movies in your private theatre, connect your android smartphone to your PC and completely immerse yourself in your favorite video game world. Widely Compatible: Supports smartphones between 3.5~6 inches. Lmax x Wmax of the phone is 157x81x10mm. Recommended phone size is 4.7-6 inches. Support Glasses: Adjustable Pupil Distance (PD) and Focal Distance (FD) functions make the SIDARDOE VR headset comfortable with wearing glasses, suitable for Myopia within 500 degrees, Hyperopia within 100 degrees, and Astigmatism within 200 degrees. Included: SIDARDOE VR headset, bluetooth remote controller, cleaning cloth, user manual, no-hassle 45 day money back guarantee, 18-month product warranty, and friendly lifetime customer service. If you have any questions about this product by SIDARDOE, contact us by completing and submitting the form below. If you are looking for a specif part number, please include it with your message.